Region: This Caterpillar can be found in central and western United States. Life cycle: This insect produces one generation each year. The adult female may produce as many as seven hundred eggs apiece. Hibernation occurs in the egg stage. Physical Description: The larva or caterpillar is a brown or grayish-black with distinct light and dark longitudinal stripes, and measures about 1 1/2 to 2 inches in length. The adult is a grayish brown moth with a kidney- shaped mark on each forewing, and a wingspan of 1 1/2 to 2 inches. The round eggs are white and are laid in the soil. 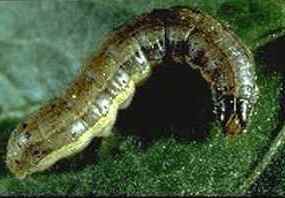 This Cutworm is so named because it is known to travel like an army, in masses, devouring everything in its path. Feeding characteristics: This caterpillar will attack all garden vegetables, feeding just below the surface of the soil, or just above, severing the stems of the seedlings. They feed at night. During the day, they hide in the grass roots in the soil. Controls: Wrap a paper collar around the stems of seedlings when they are set out. A natural predator of this cutworm is the Fiery Hunter. This beneficial insect can help control this pest. If the damage is intolerable, use Bacillus thuringiensis.